Handmade Tibetan Jade Buddha Statue Pendant - Acalanatha. 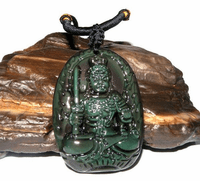 This buddha amulet pendant was handmade in Tibet from fine obsidian. Size: 43mm*30mm*10mm.Weight: 40g.